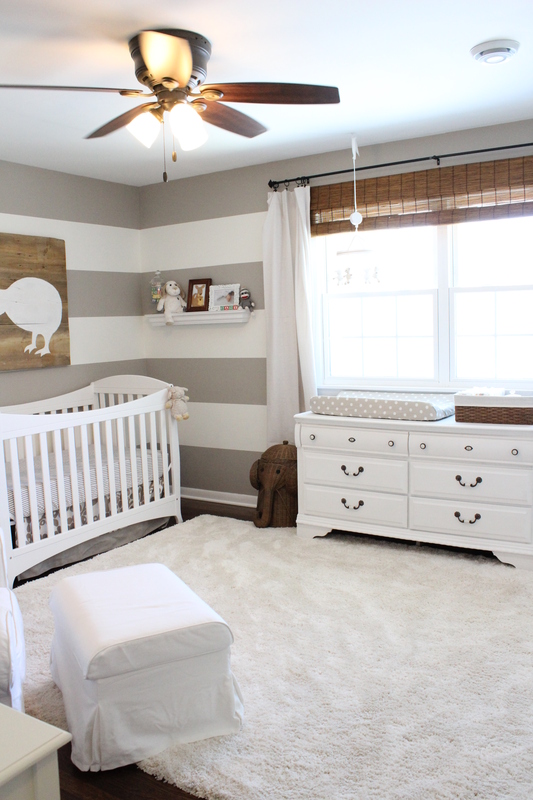 With only 5 days until my due date, it’s time to share the completed nursery! The room turned out even better than expected and is probably my favorite space in the whole house. 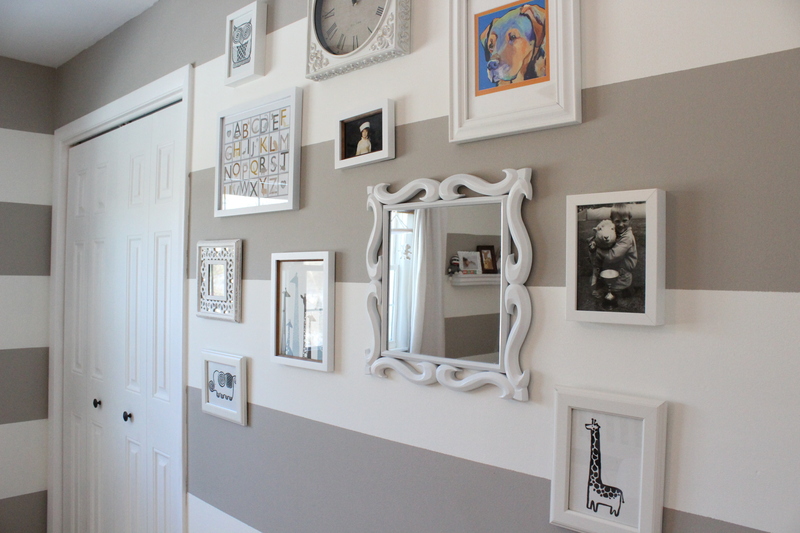 We put a lot of love into this room and DIY’d most of it. So without further ado, here is the grand tour…. Thanks to building out some shelves and buying some baskets, we have a beautifully organized closet with tons of storage. I was able to fit so much in here that the dresser/changing table is less than half full. 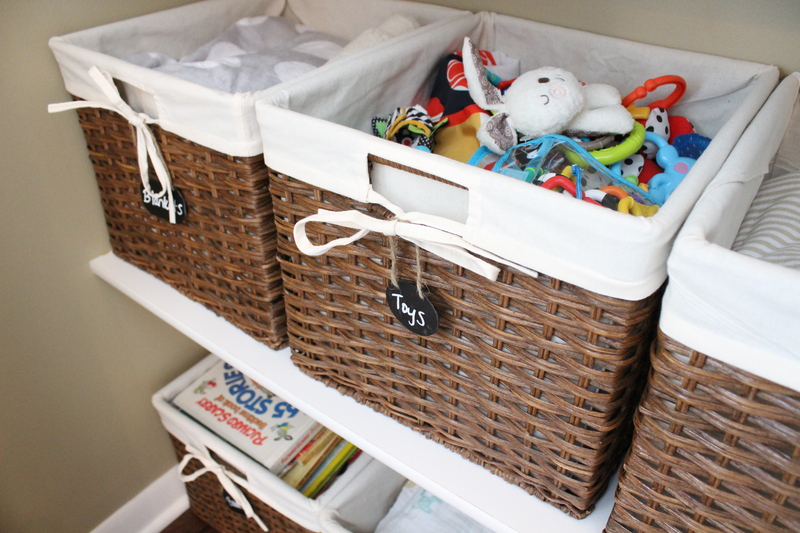 I labeled each of the baskets with chalkboard tags, so they are easily changeable. Now for a little more detail on all the different items in the room. 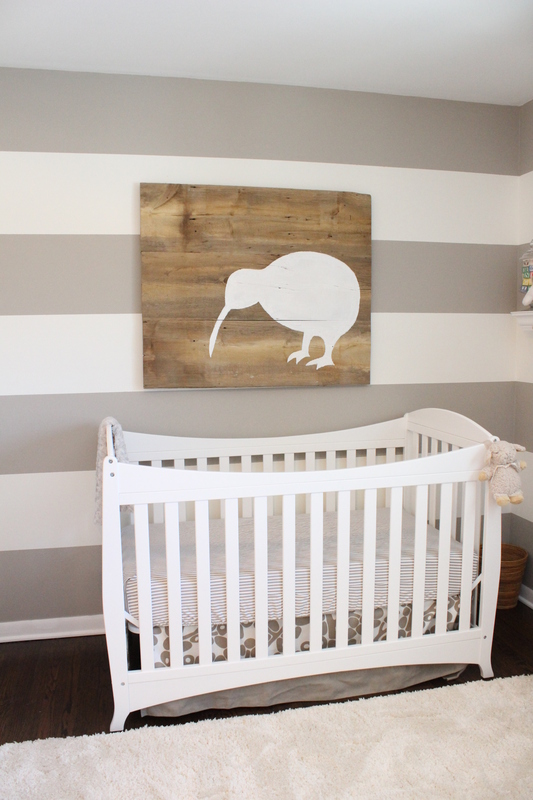 I shared here how we painted the stripes and built the crib. 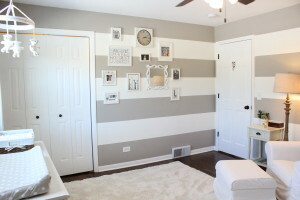 The two paint colors are Behr’s Powdered Snow and Perfect Taupe (lightened by 20%). 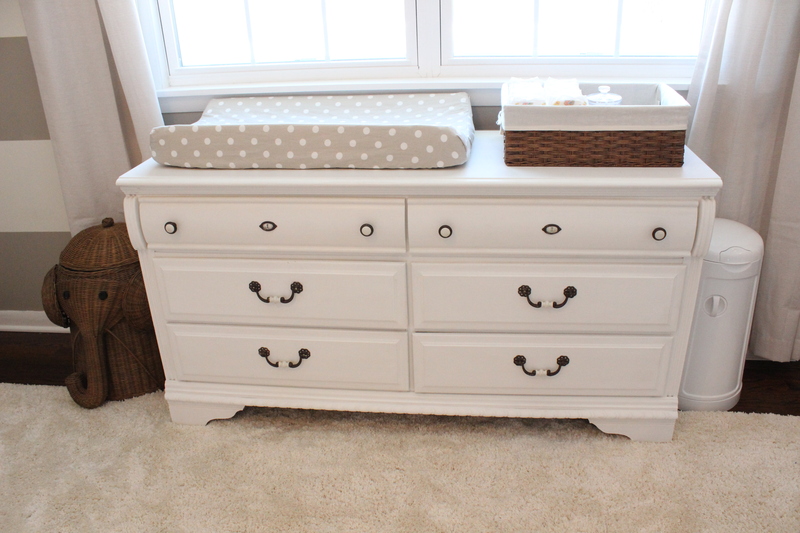 The changing table is a dresser we already had and we painted it with Annie Sloan’s chalk paint in Pure White. The dresser hardware we refinished using Rub-N-Buff (spanish copper mixed with ebony). 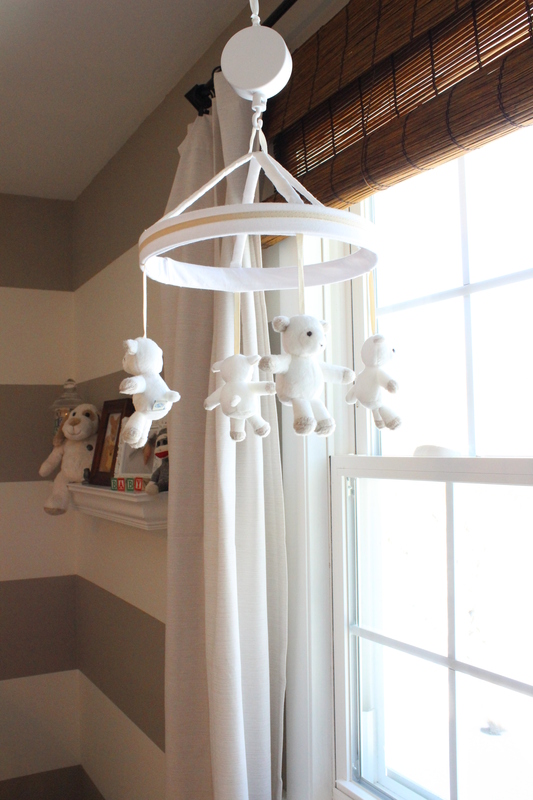 Hanging over the changing table is a musical sheep mobile from Pottery Barn. There are quite a few sheep in here as a nod to Ben’s childhood growing up on a sheep property in New Zealand. I’ll show you my favorite sheep soon. 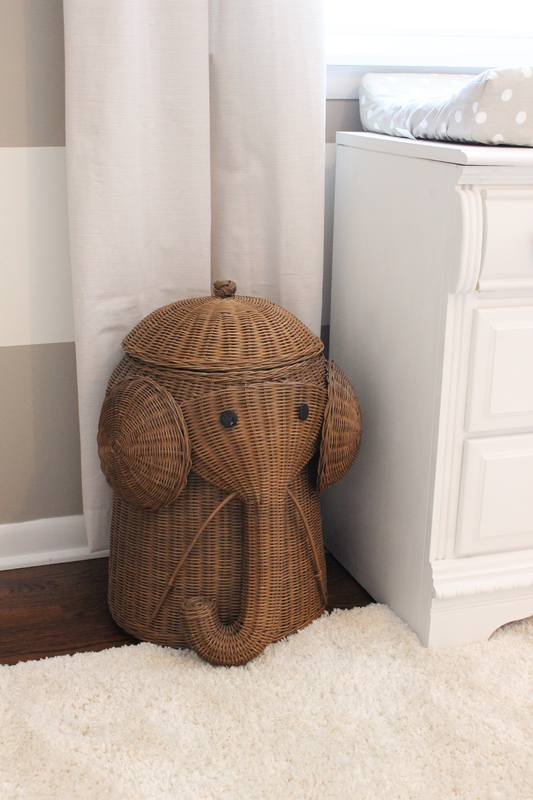 I tried to include lots of other animals too including this adorable elephant laundry hamper from Home Decorators. The art over the crib is homemade of course. 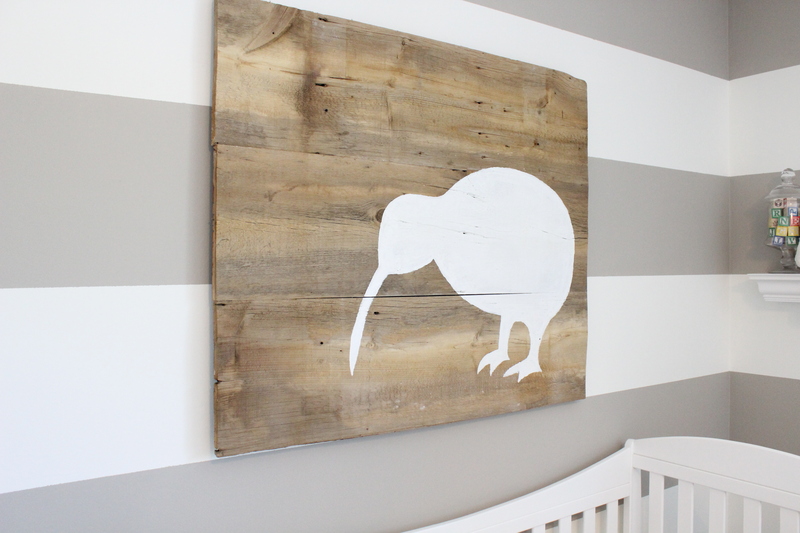 For those non-New Zealanders, you may not recognize the animal, but it is a kiwi bird, the national symbol of New Zealand. Ben built the wood sign out of some leftover barn wood that we used on the ceiling beams in the living room. I tried to freehand draw the bird but we agreed to just get a large copy made to use as a stencil. 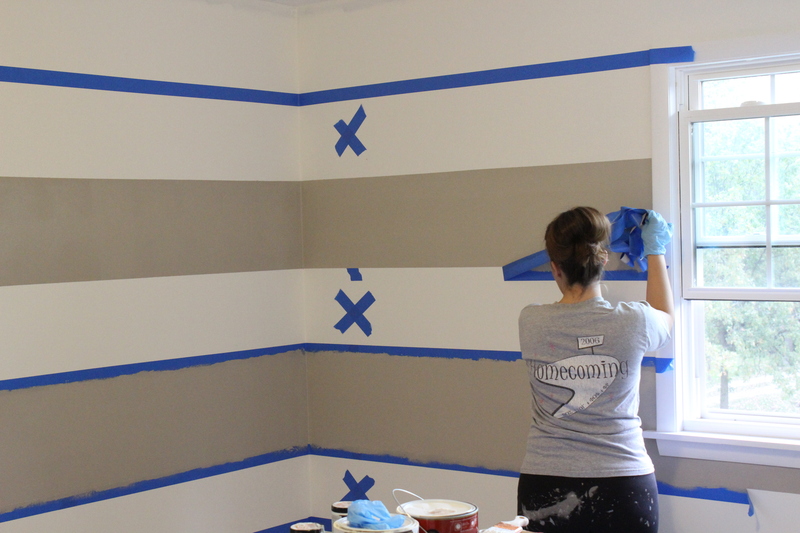 Then I painted it with white trim paint. Next to the crib is a shelf with some framed baby shower cards, baby blocks, a Harrod’s puppy from a Welsh friend, and a sock monkey which started in my hometown, Rockford IL. 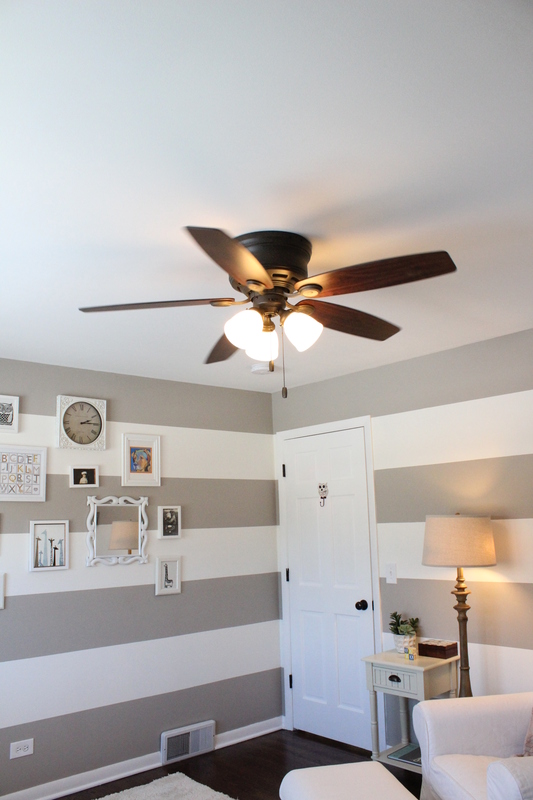 We installed a ceiling fan in the room to create some circulation and help prevent SIDS. The white Ikea Ektrop chair we already owned, except we retrofitted it so that it is now a rocker. We purchased a swivelling rocker base off of this website and then Ben created a plywood bottom and screwed it into that. I see lots of hours in this chair in my future. Above the chair are three wire baskets from World Market which hold a few books in quick reach. Next to the nursing chair is a distressed-wood floor lamp we already owned from Target and a new nightstand from Kirkland’s. On the gallery wall are a few items off Etsy, a small mirror, clock and childhood pictures of both Ben and I. Can you spot my favorite sheep? On the right is 8-year-old Ben and his winning sheep, Lizzy. 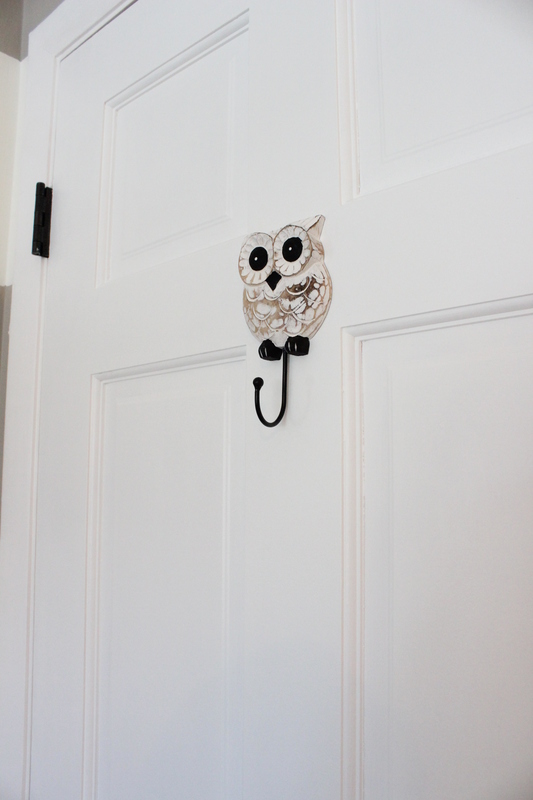 Also I love this hook on the back of the door from World Market to hang a towel or jacket. It’s the little things! And last but not least is the amazingly soft rug which came from Lowe’s. Seriously this is the the softest rug I’ve ever felt. Can’t wait to play on the floor with our little one. I can’t believe there will be a baby boy or girl living in here soon. Now we wait! Everything looks amazing! I can’t believe the baby will be here so soon! Love you guys! Absolutely adorable!! We had a gender neutral nursery as well and I haven’t changed a thing since our little GIRL was born almost 18 months ago! I love it so much! Congratulations early! I love watching you and your husband transform your home and now I can’t wait to watch as your beautiful baby transforms your lives! 🙂 Congratulations early! Best wishes for a quick, safe delivery and a healthy baby and Mommy. I just found your blog and am so inspired. I hope you and baby are happy and resting. I look forward to reading more in the future!! I love it!! So beautiful. 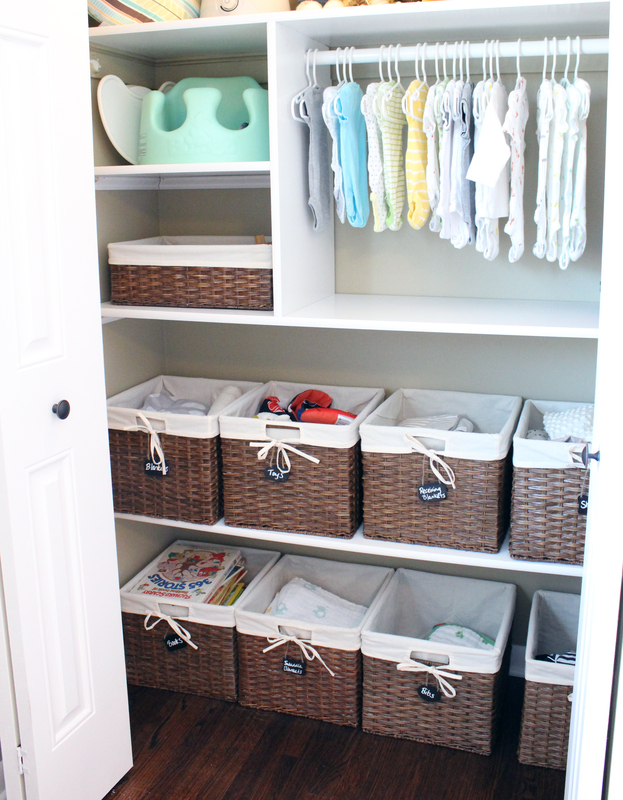 Would you mind sharing where you found the baskets in the closet? I’m looking for some just like that! Thanks Samantha. I got them at Target. They might not have them any more though. Good luck! Hi there! Which base did you use from the website for the Ektorp chair? Trying to figure out which one to buy! I forget exactly but it was a rocker base around $80-$100 I believe. Is the elephant hamper the small, medium or large one? Love the rug from Lowe’s! What brand/style is it? 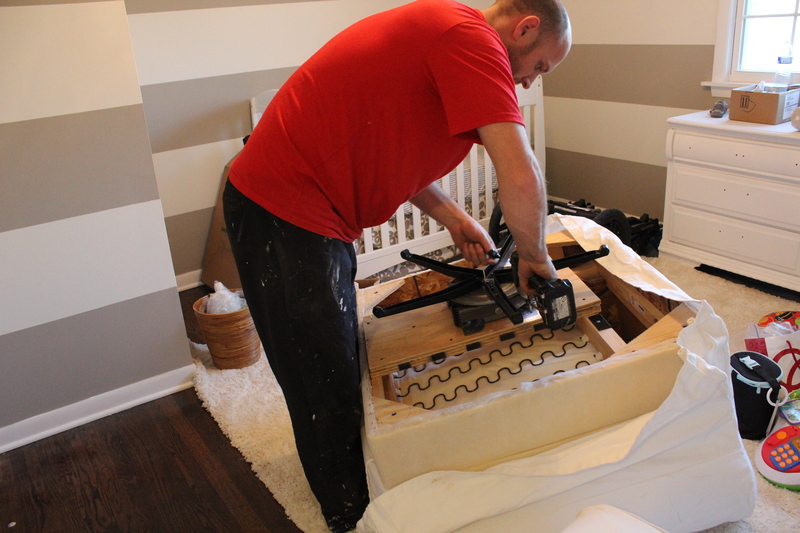 I love how the cchanging table turned out…I am going to be painting a dresser white but was conxwrned about seeimg paint streaks. Yours looks le it turned out great! Any tips or tutorial you followed to make it work? I use a small roller I think that helps hide streaks. Good luck! Very cute! 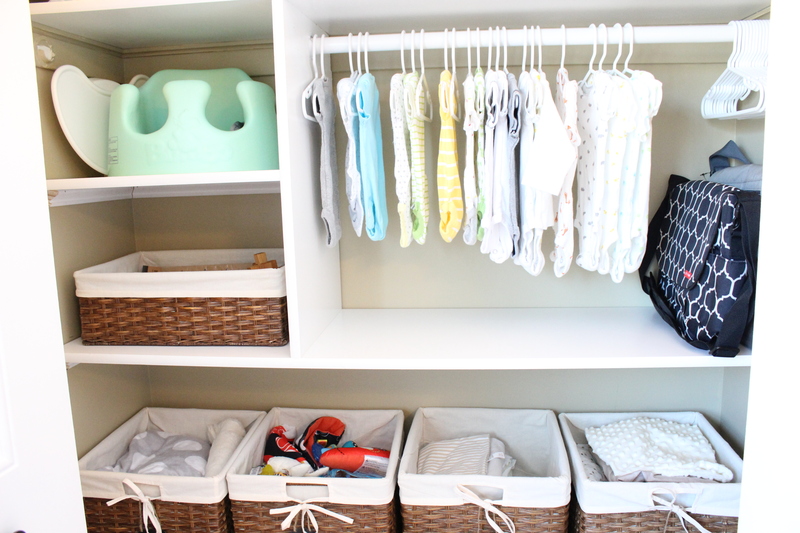 Would you mind sharing how you did the closet system? We built it from scratch using white MDF. 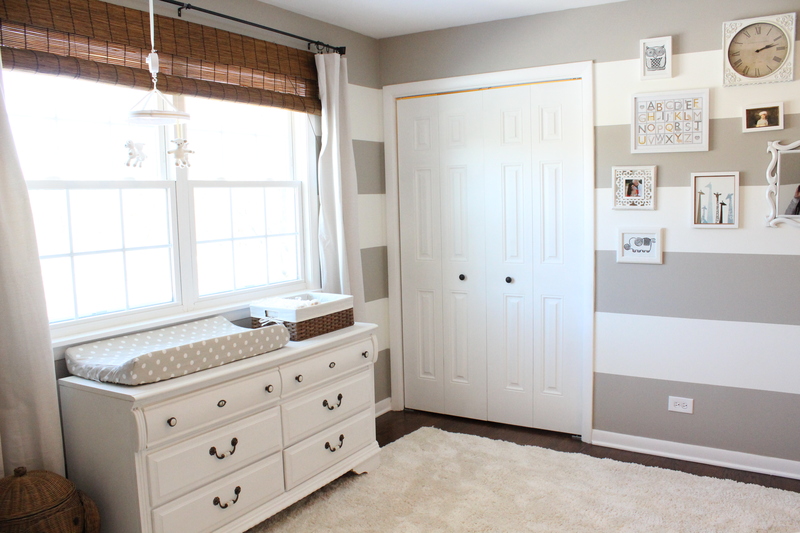 Your nursery is gorgeous! I want that same style rug for our nursery. I saw that you bought it from Lowes. Do you remember the brand/style. I just checked the Lowes Website and there are so many ivory/white rugs to choose from. I want to make sure I’m getting the right one. Thanks and congratulations on your new addition! What brand is the rug from Lowe’s? Love it! To find them on target website or any other websites. Any help would be much appreciated! I don’t think Target carries them anymore. It has been a couple years now. I’m sure you can find something similar at Target, Pottery Barn, Hobby Lobby, Michaels, etc. 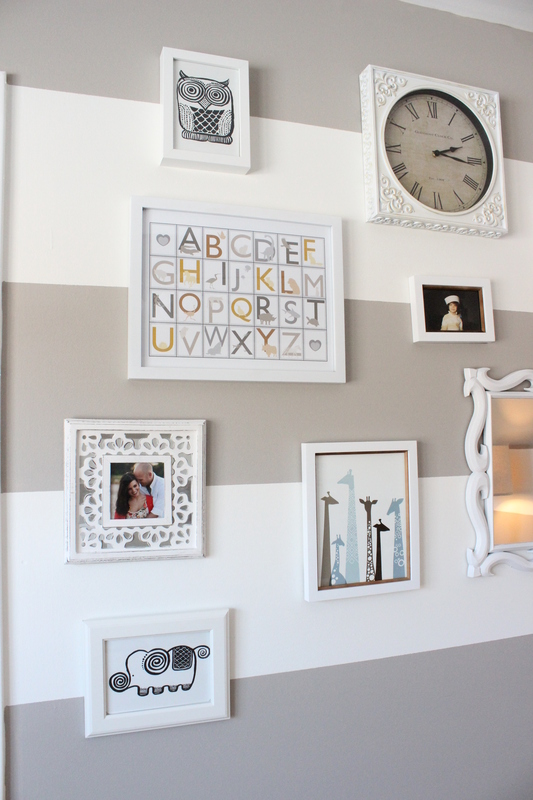 Your nursery is beautiful! Would you mind sending me the direct link or name of your rug? I’m looking for something exactly like that! Thank you! Do you happen to have the Etsy seller you got your elephant and owl from? Thanks! Actually those weren’t Etsy, they are baby flash cards that I framed. Here it is (or similar) on Amazon: http://amzn.to/1mDMPUE. I stumbled across this page and wanted to ask how that chair has held up for you. 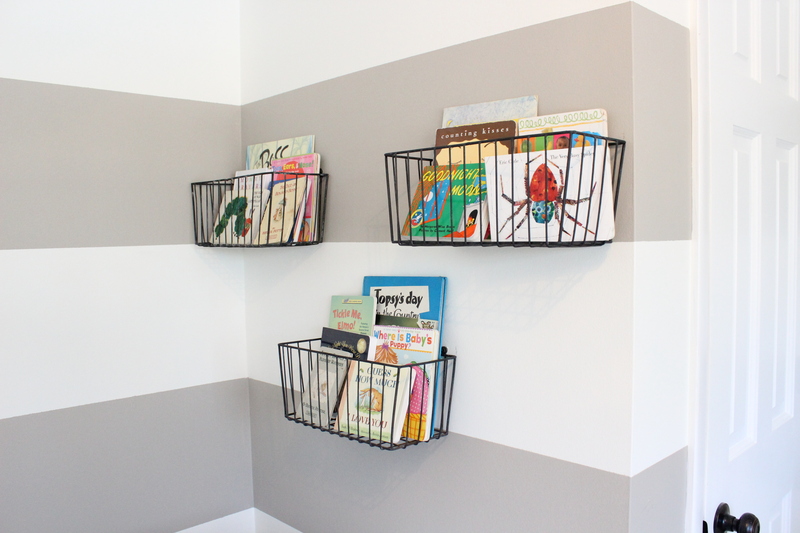 Rockers are SO DANG EXPENSIVE and I love that you created your own. I’m looking into it as well, but I wanted to ask–does it rock well? Is it fairly easy to get it to sway or does it require a bit of exertion? Also, has that iKEA chair been comfortable for you? I’m curious to know how this has passed the test of time and if it’s something I should look into. Thanks for your wisdom and help! It’s comfy but the rocking part isn’t great. It tilts forward. I might invest in a new one for any subsequent babies.